Rent a seaside holiday house to stay in Devon or Cornwall that sleeps 10 or more, a large self catering group stay in Somerset that sleeps 12, a wonderful farmhouse in Dorset or a spacious country house in Wiltshire that sleeps 15 to enjoy areas of unspoiled countryside with some great outdoor activities and hot tubs to enjoy as a group in the West Country. You could rent a large holiday home in Dorset for a celebration and go walking, horse riding, or fishing on the River Stour. Hire a large self catering holiday home in Somerset to explore attractions such as Wells Cathedral, Cheddar Cave and Gorge, Glastonbury Tor and Stonehenge. Have a relaxing family gathering at a holiday property in Wiltshire, the home to many designated 'Areas of Outstanding Natural Beauty'. Devon and Cornwall are, of course, traditional holiday areas for families looking for beaches or heading up on to Dartmoor, Exmoor or Bodmin Moor or heading down to the Lizard and Lands End. 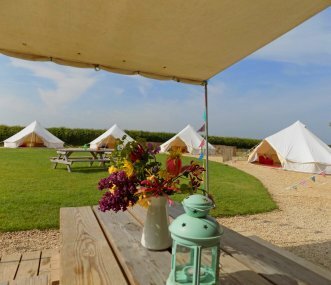 A stay in Somerset is a firm favourite for large group stays and provides the perfect setting for large family gatherings, hen weekends, weddings and short breaks. Secret Valley is set in the idyllic, peaceful countryside of Somerset. The different types of glamping accommodation are thoughtfully spread out on the family run working organic farm. Sleeps 120. Quirky log cabin sleeping up to 5 and an exclusive private glamping site with bell tents and Crash Pads sleeping up to 37. Set in a nature reserve with far reaching views to Glastonbury Tor. 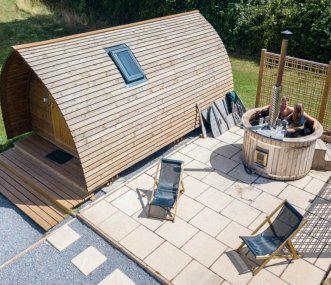 Unique glamping experience with 5 geodesic bedroom pods and communal facilities for kitchen, dining and relaxation. 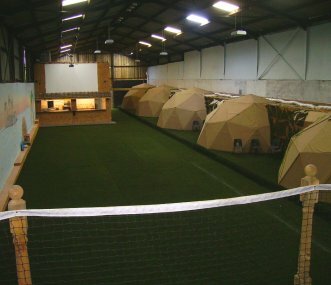 Large astroturf games area and a 5 m wide large screen TV. Sleeps 2 to 42. 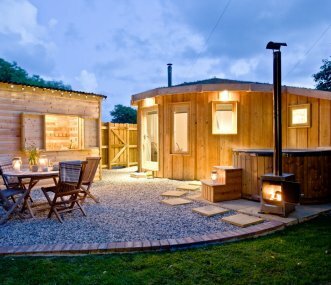 Luxury yurt, glamping and cottage site set in a countryside setting on the North Cornwall coast. Accommodates 4 - 54 guests in a mix of yurts (9), The Roundhouse (1)and cottages (4) each sleeping 4. Group accommodation is our speciality. Whether you require holiday cottages in Somerset that sleep 12 or more, a luxury lodge that sleeps 40 in Dorset or a house in the woods that sleeps 12 in Wiltshire, you can be assured that we have the perfect property for your group trip. Here at Group Accommodation we have some of the largest holiday properties in England for your perusal. Browse our website for an unbeatable selection of large holiday rental properties online. Our large group holiday cottages are dotted around the region allowing you to explore your chosen location and explore local group activities and sightseeing opportunities. As a leading group accommodation specialist, we are dedicated to sourcing a superb selection of holiday cottages to give large groups of holidaymakers a choice of accommodation. We understand that having a large group of people travelling together can put limits on the type of accommodation you can choose but we have sourced some gorgeous group stays in Somerset that sleep 12 in sensational settings. Our Dorset holiday cottages are perfect for large groups and provide spacious living areas that boast luxurious facilities. Whilst our range of holiday rentals and seaside houses in Devon and Cornwall number more than a hundred to choose from. If Wiltshire is your county of choice then use our map search to help find your specific location and refine your search further by how many you need to accommodate and the type of property you are interested in. Book your group getaway today.